This is related to my recent post on the Wintersilks Comenity Bank credit card scam. It turns out that not only did Wintersilks sign my mother up for a completely unwanted "stealth" Comenity Bank credit card -- which my parents only even realized they had when they eventually opened what turned out to be a statement from Comenity Bank indicating they owed nearly $100 in late fees -- but they also signed her up for Wintersilks' VIP-plus program, and billed that to my parents' credit card for $14.97 per month. I called them up and the customer service representative quickly agreed to take the charge off of the account (i.e. refund the money to the non-Comenity Bank credit card to which it had been charged). Apparently there was $1.99 "introductory" charge for July, and $14.97 for each of the following months. I have no complaints with the products or shipping for Winter Silks merchandise. But somehow I got signed up for a "VIP program" that sucked $14.95 out of my credit card every month. Fortunately I was able to call and get the last three months taken off, which might be all I was charged. But that's a complete scam! I don't even know how that happened. Beware! Customer service was courteous enough, so just call them if it happens to you. I had the same experience. I never signed up for it; just happened automatically after I had made an online purchase. Unfortunately I didn't pay enough attention for many months, and when I did investigate I found I had been charged $14.97 for about 10 months (shame on me for not noticing. My bank was able to negotiate a 4-month refund. I had the same experience. I called them and had it taken off. It seems like it was the default option and you needed to select something to get out of it. I will not be ordering from this company again because I do not like supporting companies with questionable business practices. I was charged $14.95 by Winter Silk as. VIP Plus member, a program I'm sure I never signed on to. 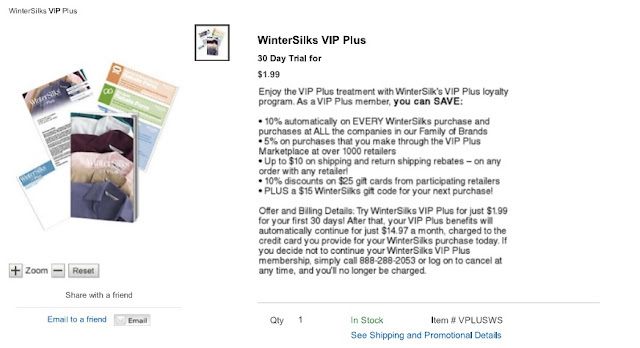 I thought Winter Silk was a reputable firm, but now I'm not sure. I will be very careful if I order again from them. It's possible that Wintersilks just has a few rogue customer service representatives whose compensation is tied to signing people up for the VIP program. Just like the 5000 Wells Fargo employees who set up false accounts for customers without the customers' knowledge. But they are profiting from it, and I would guess that they are profiting from it quite a bit, and they have an obligation to weed it out. The fact that one person up there who was signed up for 10 months was only able to negotiate a four month refund tells me that Wintersilks reps are trained to deal with this complaint, and that they will not always simply give you your money back. 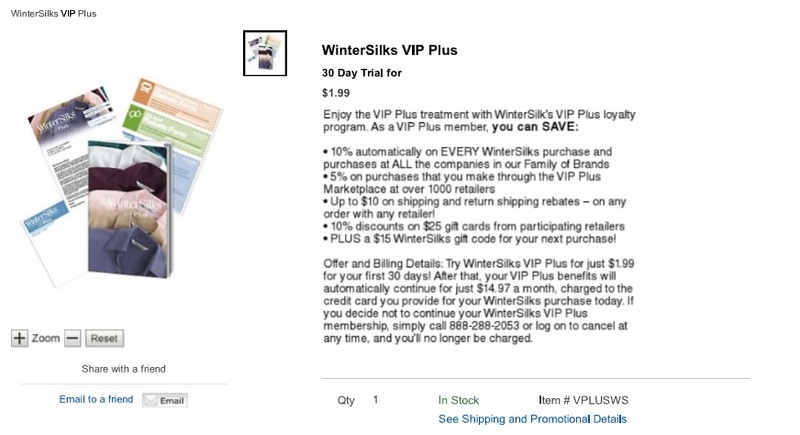 Elsewhere in the site, it is clear that Wintersilks is affiliated with Blair.com, and sure enough, Blair.com offers a similar VIP-plus option, which gives the same 10 percent off on presumably the same "family of brands". The companies in our Family of Brands include: Appleseed’s, Bedford Fair, Blair, Draper’s and Damon’s, Gold Violin, Haband, LinenSource, Norm Thompson, Old Pueblo Traders, Sahalie, Solutions, Tog Shop, and WinterSilks! To be reminded of something, I would have had to have been told in the first place. I did not sign up for a membership. This is a scam. The links provided do not send you to the Blair vip website. In the photo, please note the period at the beginning of the web address which invalidates it. In order to get to the proper website to cancel, you must search for it and then login using the password they assign you, rather than the password you created for the regular Blair website. Thank you for the comments.I just got hit by Blair VIP PLus on the auto enroll. I had ordered one item in December of 2015 and just noticed that for the last 2 billings cycles, a $14.97 charge has shown up. Missed catching the first one. The good news is that when we called Blair at their 1-888-2887708 number, they cancelled the VIP auto enroll and (only we specifically asked) offered to credit the last 2 monthly charges back to our account. BUT, you can be sure that we'll be monitoring the account much closer from here on out. I have been charged twice without knowingly signing up for it.I ordered once from them and that is all.Once they got my credit card number they think they can continue charging me for something I don't want. If you get something for a good price but later get charged for other stuff it wasn't such a good deal after all. My advice to myself and others is to be sure you are dealing with a honest company before giving your credit card number. blair did the same scam on me-i never ordered the vip plan.i sent back all items ordered -they canceled my account-i got the vip charges removed. customer service said i owed nothind-but i get about 12 calls a day from cominity bank. they now have late fees up to 96.oo dollars on this account. they are crooks and scammers. i am on disiabilty and cannot pay for false charges. or i should say willnot. i sent back last package with my own postage. I placed an order and never got email stating they received it. Never got email that it had shipped either. Called today to complain about this VIP you can join which they make it sound like it is free, which is $14.95 a month but the month you join with your order it is 1.99. I called to cancel but they said they cannot credit my $1.99. As a matter of principle, I called to cancel my order, to which they said it had just shipped... how convenient. I am returning my order and NEVER ordering from them again. I asked them to take me off their mailing list too. I am going to complain to my credit card also. It is a scam and they are probably making a lot of money out of it. What can a catalog really give you for $14.95 a month??? Really... Anyway, you live and learn. Do NOT order from them. There are many other sites out there that are honest and not unscrupulous like the gold violin. Beware of signing up for Appleseeds VIP Plus when ordering on line. It is hidden with a discount on your order followed by your credit card being charged $14.97 each month. VIP for a catalog? So disappointing... I was charged for 2 months before I caught it; I received absolutely nothing for it. "My review is a little different. I ordered a bedspread which I got promptly and I love it. BUT two months later I caught a $15 charge on my credit card from them. According to them, I signed up for a $15 coupon on my next order when I placed my order and unknowingly signed up for this vip service. When I called, two different reps I spoke to were so rude and made me feel completely stupid. I was livid! I will never order from this company again. Apparently, they're trying to make up for their bad customer service losses by scamming people out of a monthly fee that they hope you won't notice. Beware!!!" The last two orders I have placed with Old Pueblo Traders they have placed a third party charge on my credit card. The first third party charge was for $1.95 and the 2nd third party charge was for $14.95. The charges are listed on my credit card account as AMO Smart Saver RWDS. I called Old Pueblo Traders Customer Service department and was advised we had requested this added service at the time we completed our order and checked out. On the $1.95 charge their customer service Rep. in South America gave us a $2.00 credit toward our next order. On our next order we did receive the credit, but we also received the third party charge of $14.95. Their customer service Rep. told us to call AMO Smart Saver REWDS at 866-679-8650 and they will issue us a credit. We will not be placing anymore orders with this company. Have to spend to much time on the phone getting credits. I placed an order with sahalie in dec 2012 and was signed up for their VIP PLUS program through placing the order. I wasn't aware of signing up for anything and wax charged $14.97 a month since that date. My husband never questioned the charges because he assumed I authorized these charges. When I found out about this problem, I called sahalie, I was given a separate number to call and cancel the service. I was connected to "Shaday" when I called the number and she told me that I was signed up for the program when I used a promo code for 15 percent off my order...still don't remember that. She said they had a strict "no refund policy", but would see what she could do to help. It sounded like she was reading from a script. She put me on hold and came back with an offer to refund all changes up till jan. 2013. She continued with her speech and when I tried to explain why this program wasn't questioned or cancelled I was disconnected. I will never order from this shady company again. Buyer beware!!! Several months ago I purchased a pair of insulated insoles for my shoes from this company. Somehow in the process they claim I signed up for something called VIP Plus. The following month I found a $1.99 charge on my credit card which I disputed with my credit card company and figured that was the end of things. Not so. The next month I got a charge for $14.97 which I also disputed. I called the Norm Thompson and was told I could cancel my membership but that they would not refund the charges. Everyone should be wary about this company and it's hardline policy. I believe I in fact did not sign up for VIP Plus (I'm relatively savvy about this sort of scam) so the only other assumptions I can make are that I made an error, they signed me up against my instructions, or it was somewhere in the fine print or an otherwise non-obvious decline offer check box. We'll see how it plays out but you all should be warned that this company plays hard ball and has no interest in providing superior customer service. I'll be sticking with Amazon or similar reliable sellers in the future. Without realizing it, I have been charged $14.97 for almost a year. The only reason I saw it was because I noticed it on my final Costco American Express Bill. I called them and they could not even link my credit card number to the number they were using but it had my name on it. I have never ordered anything from them, nor have I had any dealings with them. I expect a full refund and termination of any contact with my credit crd. Date Occurred: 03/05/2015Reported Damages: $74.85Location: Charlotte, NC ! I did not authorize these people to take any money from my Discover Card. They have taken it out of my account for the past several months. I will never do business with them again. I just noticed a charge on my account for $14.95 that I didn't recognize. When I called VISA I was told I signed up for this service when I placed an order. NOT TRUE. Now I see all of the complaints online about this. Either don't order online or be very very careful. I am going to try to get a credit now... FYI Fabletics did this too. I signed up for a monthly membership, but when I cancelled they don't process it. I'm told I'll get a confirmation via email in 24-48 hours. Never happens. I THINK I HAVE MY PROBLEM WITH THEM SOLVED AFTER MORE THAN TWO YEARS, WHICH STARTED WHEN I STARTED CHEMO. THE LAST SOLUTIONS CATALOG THAT I RECEIVED SAID THAT THEY WERE GOING OUT OF BUSINESS. I HOPE IT'S TRUE. I FINALLY REACHED A REAL PERSON AT 1-855-876-2255! SHE WAS A VERY NICE LADY WHO OFFERED ME THREE MONTHS WORTH OF CHARGES REFUNDED TO ME AND TO STOP FURTHER CHARGES. HOPE IT IS TRUE!! GOOD LUCK TO EVERYONE OUT THERE!! I THOUGHT I WAS CRAZY BECAUSE I COULD NOT REMEMBER SIGNING UP FOR THIS. THEN I READ ALL OF THE OTHER COMPLAINTS. HOPE EVERYONE CALLS!!!!!!!!!!!!!!!!!!!!!!!! unauthorized billingUpon receiving my bank statement today, I noticed a charge from NTO Solutions for $14.95 that was neither made by me nor authorized by me and I would like this amount immediately refunded to my account ending in 6864. If not I will be contacting the proper authorities about this fraud. Monthly withdrawal of $14.95 from Discover card for "Solution Rewards"
I accidentally discovered this scam when I stopped my credit card. The $14.95 payment, which I NEVER agreed to, has been withdrawn monthly without my knowledge. How can I stop this from reoccuring? I did NOT sign up for NTO Solutions Rewards program – this is a SCAM. I placed an order and in doing so unbeknownst to me I was automatically enrolled in NTO Solutions Rewards Plus program which I was told was free for 30-days then it automatically charged my credit card without my permission. We were paying our American Express on 6/27/2015 and noticed a charge of $14.95 from NTO Solutions Rewards. The charge shows up as merchandise apparel shoes when you search on AMEX to review the billing. My husband usually reviews and pays the bill, my bill was quite large from some traveling last month and he asked me to check the charges. When I noticed this charge I immediately called NTO Solutions as I knew I had not ordered this. I then pulled all of my AMEX statements going back to 2/2/2013 and each month a charge for $14.95 by NTO Solutions Rewards. I called the company and spoke with a customer service person with a foreign accent and told him to immediately cancel this account and asked for a credit. I was told this was a charge for a rewards program that they said I signed up for a 30 day free trial when I placed my order in 2013. I told him I did NOT sign up for this and that this is a SCAM. To my amazement when reviewing my bill further I notice another charge this one is from Norm Thompson for the exact same amount $14.95 and immediately called and canceled to which I was told the exact same thing that it was a charge for a rewards program that they said I signed up for a 30 day free trial when I placed my order in April 2015. The light went on – I immediately went online and discovered this is really a big SCAM by a number of companies and I will NEVER shop with them again and I’m telling all my family members, friends and anyone who will listen about these companies and this SCAM. My investigation revealed that apparently they trick you to thinking you’ll either get 20% off your next order or free shipping IF you type your email address and hit sign up. NOTE none of the websites below states anything about any charges all they want is your email address. Apparently NTO Solutions Rewards is tied to 14 stores - check out the website - go to www.solutions.com and across the top you'll see the names of the 14 stores – and I bet every one of them has this scam going on. I’m not going to find out as I will never visit these websites. Something has to be done about these practices. We were paying our American Express on 11/7/14 and noticed a charge of $14.95 from NTO Solutions Rewards. The charge shows up as merchandise apparel shoes when you search on AMEX to review the billing. My husband usually reviews and pays the bill since he often uses it for his job and is reimbursed for many charges. This month he asked me to look at it and make the payment. When I noticed this charge I did an inquiry and knew I had not ordered anything online. I took the time to pull all AMEX statements going back to 12/4/12 and guess what EVERY month a charge for $14.95. This totals $358.80. As soon as customer service opened at 9am I called to report this and ask for a credit. I was told this was a charge for a rewards program. They said I had been offered a chance to TRY it for 30 days BACK IN DECEMBER of 2012. I have NO recollection of this although I did purchase some rugs from them that fall. I was told I could cancel the membership as of TODAY. I said I wanted a refund of the $358.80 that had been scammed from my account. She said the best she could do was offer me a $29.90 credit. When I told her this was crazy and the equivalent of stealing she passed me to a supervisor. The supervisor Eric told me he could not give me a credit and we should have noticed the charge sooner. I asked if this is how they justified stealing; if the customer doesn't notice it is okay if they steal until they do take notice. He said he was sorry I felt this way and even though he does not do this often he offered to credit my account $89.90. While checking on the internet for complaints against NCO, I noticed another customers complaint and saw they also were offered the $89.90 final credit deal. I am appalled that this information is online in print and the company is still getting away with it. I have filled a grievance with American Express and am writing a letter to Consumer Reports. I am also going to file a claim with the Better Business Bureau and am considering calling our local TV station that has a section called "Don't Waste Your Money" I guess small claims court is also an option. We are all warned to check our statements closely for repeat charges. If this had been a larger amount it would NOT have gone unnoticed. However, the fact that when you do an inquiry on AMEX and it show up as apparel shoes makes it tougher. My husband would almost never question me spending $14.95 and especially is it were for something we all use like shoes. BEWARE OF NTO SOLUTIONS Rewards SCAMMERS. Such a shame we have these kind of business people! There are many other places to shop. I found a $14.95 charge on my credit card statement in March 20 from NTO Solutions. This was for a $15 off shipping offer but never received anything. I called on 3/12/13 and cancelled my subscription and asked for a refund, but wasn't given a refund. Again this month I found another $14.95 charge and I called again and was told it would be cancelled but I don't believe them. I am going to file a dispute with my credit card company since I am getting no cooperation from NTO Solutions. This also happened to me,I SIGNED UP TO RECEIVE FREE SHIPPING EVERY TIME THAT I ORDERED. THIS NEVER HAPPENED.ALSO, I THOUGHT THAT I WOULD EARN POINTS FOR OTHER ITEMS. Never happened either. I tried to call this # 888-354-6324 no luck. I found this company charging my account monthly $14.95 without my authorization only after reviewing my end of year statement! After reading the complaints on line, I decided to cancel my credit account immediately. I'm not yet aware of how to get any of the money returned. When you buy from this company you are automatically signed up for "rewards" which without authorization, they debit your credit card for 14.95 every month. This company is running a scam. Somehow got roped into NTO Solutions Reward, which is extremely deceptive and tied to the Solutions.com web site. I've been charged $14.95 since June 2012. The best part is I've received no benefit or reward package in the mail for these charges. I spoke to someone in India, and still have no idea what this program is about. I've had to cancel any participation and report the problem to my credit card company. I also see many customers on the Web have reported the same problem. Solutions should end such a deceptive program on their Web site, and any further association with this rewards company. There is no benefit! This is a rip off. Same thing happened to me. Apparently, I "signed up" when ordering Christmas gifts and clicked on a $15 off shipping offer. Really?! I'm an experienced online shopper of many years and certainly didn't expect such deception from what I thought was reputable online retailer. Solutions.com has lost this customer. Anyway, the only members of the "family of brands" for which I couldn't find complaints about the VIP plus scam were Bedford Fair and Drapers and Damons. Deal with them at your own risk. I had been going to file a rebuttal, having been an employee of Orchard Brands but, quite frankly, offering rebuttals was all I did all day long for that company and I began to think of all the ways in which I as a past employee have been victimized by them as well. Therefore, I will be filing this under a "claim," although these places have never ripped me off personally. Sadly, I was the person doing the ripping off. I was a phone order representative for Orchard Brands, specifically for the following stores: Norm Thompson, Solutions, Sahalie and Gold Violin. I quit after they tried to put me on four more companies: Appleseeds, Tog Shop, Drapers and Damons (or "Drapers and Demons," as it was known around my call center), and Wintersilks. That put me working for eight different companies - that means eight different scripts, eight different offers, five separate order screens and eight separate websites dealt with during every shift. In any case, I can attest firsthand to the fact that Orchard Brands is involved in ripping off its best and most loyal customers. Orchard Brands partnered with Encore Marketing International a few years ago. Encore, as I shall refer to it from here on out, describes itself as having "helped hundreds of partners find hundreds of hidden profits since 1978. "As a thank you for ordering today I'd like to offer you x% off your next purchase and free shipping on today's purchase just for signing up for (Brand) rewards, which will save you money on travel, shopping and eating out." They tailor what they offer to the demographic of the particular company, so often times they will offer percentages off groceries and prescription drugs. If you say no to this offer - which is what you should do - the agent has been instructed, and most of the time will, offer a rebuttal, stating that they "understand your hesitation, but (Brand) rewards is a great way to save money on everyday purchases." The agents are instructed to offer at least one rebuttal in order to avoid being fired for not following orders, but to offer as many as they can without causing their customer to hang up. As a humorous aside, if you do stay strong and continue to refuse the offer, and your agent says "okay," she will be in trouble because the "Encore Police," as we called the people monitoring our calls, remind us constantly that "okay is a bad word. A no is never okay." If you do accept the offer, your agent will begin to read a scripted paragraph which they are legally required to read word for word. This paragraph, in summation, states that you will be charged $1.95 for a thirty day trial of (Brand) rewards and will be charged $14.95 for each subsequent month afterward, if you do not call to cancel your membership within 30 days. It states that you do have 30 days to call and cancel, and that you will get a membership "kit" in the mail with an 800 number that you can use to call and cancel, and that this kit should arrive within about two weeks. Usually, this is where people say no due to the recurring charge. That's the point at which most offers are rebutted and, upon a second refusal, most reps will give up as we all know what a piece of crap this offer is and don't like selling it. Some reps, though, are all about their jobs and will continue to harass you until you threaten to cancel the order, at which point they are instructed to give up. The rep is required to hear you say the word "yes" or "fine" after this paragraph in order to proceed. If you say anything else you will be asked "was that a yes," or some variation of that question in order to get the word yes. If you accept this legal agreement, you will be asked to enter the last four digits of your telephone number. The rep must hear all four tones on your telephone touch-tone keypad in order to proceed. Once you've entered those four numbers you are locked into the program for at least the $1.95 charge. All companies under the Orchard Brands umbrella have adopted some form of this Encore program. All programs are beginning, now, to offer magazines from a third party called Magazine Direct after the Encore offer as well. By accepting the offer for the magazines, you get a certain percentage off your current purchase. You have to order three magazines in order to get your full percentage off - usually something crappy like 15% or so. These are one month trial issues of the magazines, but the rep will inform you that you will have 30 days to cancel the subscription with no further charges. She will tell you how much each magazine is for the year - the subscription fees - and will then ask you again for the four digits of your phone number, which is used as your confirmation of acceptance of the offer. From what feedback I've received from customers, the membership booklets take a long time to arrive, and by the time they do many people have either forgotten that they enrolled or weren't fully aware of what they'd enrolled in to begin with. So, you've noticed a strange charge on your card and don't recognize it. You call the company which appears to have issued it - customer service for the store from which you placed your original order - and are told that that company does not handle the rewards program, that it is administered through a different company. They will give you the number to call for Encore or Magazine Direct and you will sit on hold forever and you will be lucky if you get to speak to anyone. You'll be a miracle worker if you can manage to get back much money at all from these third parties, because even though you were confused and not aware of what you'd signed up for, their official position is that you agreed to it by either accepting the offer online (which always appears in especially fine print after you accept an offer of a percentage off or some other incentive) or you entered the last four digits of your phone number during your telephone order. 1) Your customer service agent or order rep knows very little about these offers until they've worked at the company for a few months and have heard all the dirty little secrets about them from the old-timers. We are told in training what wonderful programs they are, etc. etc. and even though most of us know that it's just another "exclusive offer" that carries with it a lot of fine print, we are told that it's easy to cancel. We are told to instruct our customers that it's easy to cancel and that just by getting free shipping they are saving money. What you're not made aware of - and neither is your agent, formally - is that when you do get your percentage off coupon, it is only good toward a large purchase - usually along the lines of $100 or so. Also, your "free shipping" will be in the form of a refund check which Encore will send to you after you send them your original or copied packing slip from your completed merchandise order. So you'll be waiting for that free shipping/shipping refund for at least a couple of months. 2) Your agent is monitored constantly by the "Encore Police" as well as company agents who monitor calls for quality assurance. If your agent does not read her script, says "okay" when you say no, or does not ignore your refusal and offer at least one rebuttal, she can and will be reprimanded, with consequences being up to and including termination. Furthermore, most call centers are in areas where work is hard to come by and minimum wage is the going rate. The company offers a dollar or two above minimum wage, which keeps the applications flowing in so that if someone doesn't sell enough or isn't pushy enough, they can be terminated in order to make room for a new trained monkey who is just a little more easily led. So these agents are in tight financial situations - most of them having children, school loans, mortgages and car notes which prevent them from getting too insubordinate, no matter how wrong they believe the company's practices to be. 3) Your agent is telling you the truth when they tell you that it is a different company you need to deal with in order to get out from under the program. The 888 number that they give you to call and cancel is correct. But just as Encore hopes that you either don't understand what you're signing up for or that you just won't remember to call and cancel, they're also banking on the fact that you'll get sick of sitting on hold and will put off canceling until another time. And another time. And another time until you've been charged for two, six, eight or more months of service. So the store's agents are giving you the correct information, but Encore is neglecting to answer their phones. 4) Agents at my call center received one dollar - which was taxed before it reached them, meaning that they actually bring home about 65 to 70 cents - for each offer that is accepted. It's not a lot, so don't assume that the agent is being pushy to line their own pockets. Although there are some smooth agents that can net about an extra ten to fifteen dollars a day closing offers (I was one of them), very few are successful enough to make five bucks a week off your acceptance of these offers. So when you call to complain, remember that your agent isn't getting anything from your unfortunate enrollment except the price of a crappy fast food meal and the fact that they may not be canned...for today, at least. 5) We know that it's a ripoff but we also know that we have bills to pay and there hasn't been a "help wanted " ad in the paper for a week or more. And when work does become available it get snatched up like a gold necklace on the sidewalk. We do not get off on helping Orchard Brands and Encore sneak your money from you, but we often don't have a lot of other options. Calls are monitored and people are let go every single day, and when that job means the difference between keeping your utilities turned on and getting an eviction noticed, you're always going to choose the option that is least likely to result in homelessness. 6) Agents get short-tempered because we spend all day dealing with the same complaints over and over again and we take the brunt of the rage and frustration that our customers express for our company. Most of the time we agree with them but are not permitted to admit such a fact, for fear that a manager could be listening. But we have told the company several times that we would make more sales per day if we didn't have to spend an extra five minutes on every call trying to sell our customer something he or she doesn't want. If we could just let you order what you want we would be so much happier. Believe us, we are customers too, when we're not on the phone with you and we would be just as irate as you are if we were you. But we need a paycheck at the end of the week. 7) Your quarrel is with Encore and Orchard Brands, not their agents who are helpless to help you unless they are fortunate enough to be in a position where they don't need the job in order to meet their basest of needs. I was one such fortunate person, and chose to endure the endless process of trying to find a job rather than continue to perpetuate this scam. Not everyone is as fortunate as me and, sometimes, a kind word or a little understanding is all that's needed to keep these agents from going home and putting a gun to their heads. I've been told by customers that I should die, that I should throw myself in front of a bus, that I should be stabbed and raped in an abandoned alleyway and that I should be ashamed of myself for what I'm doing to them. Trust me, if I were on the receiving end of the big money these companies are making I'd be a much wealthier girl. 8) The most important thing to remember is that you as an individual are right and have the right to be treated fairly by the companies to whom you choose to give your business. But you as a collective group need to rise up and let these companies know that you are not going to tolerate their shady offers. Many of the companies under the Orchard Brands umbrella are struggling due to these third party offers, which are like parasites latched on to mail-order catalogs that were struggling from the get-go. The only way to make these companies listen is to hit them where it hurts by refusing to order and creating a coalition of other customers who will agree to do the same. Good luck to everyone who has been victimized by these companies. Let them know as a group that they've lost loyal customers in the pursuit of a small, immediate gain. We employees don't make a difference, even though we scream until we're blue in the face. At least as a customer you mean a little more to them since you're paying them, not the other way around. That's it. Nothing more I can say. And there's really nothing more that I can say either. Somebody needs to file a class action here -- this scam has clearly bilked customers out of millions and millions of dollars.